It only seems like Magic! Some modem problems are caused by common mode noise and spikes on the phone line. If you have common mode noise on your line, the MODEM FILTER will immediately fix these problems! Because of the Modem Filter's design, it also stops common mode spikes on the line that can damage your modem. Plug the Modem Filter into the modem, and plug the line cord into the Modem Filter. No other connections or power needed. 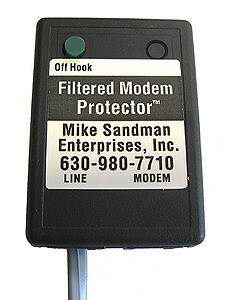 NOTE: We also have a Modem Protector™ with a Modem Filter built-in, which will control the loop current on your line as well as eliminate common mode noise, letting you achieve the maximum modem speed possible on your particular phone line (as well as preventing damage to your modem from high loop current). One pair passes through Filter (RJ-11). Two pairs pass through Filter (RJ-14). or Never Worked on a Line? Many PBXs and Phone Lines have way too much loop current for a Modem. So what happens? It Burns Up at the WORST possible time! Automatically regulates the loop current from the phone company or a PBX to 25ma. Prevents PCMCIA Modems (PC Cards) and Faxes from being blown up! Protects your modem if you accidentally plug it into a digital phone jack that was not designed for analog phones or modems. Fixes UNFIXABLE modem connection problems if you have high loop current. Also works on fax modems, fax machines and phones that have problems with high loop current. Includes lightning and surge protection for your modem, and even the phone that's plugged in with it! Small and lightweight with a 6' flexible modular line cord, it stores easily in your laptop's case. Allows for fastest data connection possible. Helps stop garbled data and disconnects. 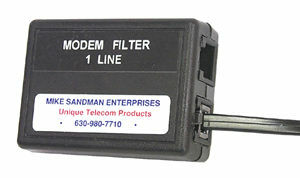 Combines our Modem Filter with our Modem Protector™, all in one easy to use device. Buy one now, or wait until you blow up your modem when you need it most! See our Modem Protector™ Tech Bulletin to see how The Modem Protector™ protects your modem. See our Loop Current Tech Bulletin for complete technical information on Loop Current.